Fans of Jack Bauer rejoice! That’s because 24: The Complete Series is now available in one gigantic box set containing 57 discs of shootouts, fistfights, double agents, and last-minute rescues. If you’re a longtime devotee of this Kiefer Sutherland TV series from Fox, there’s no better way to enjoy all the white-knuckle thrills. And for those of you who’ve never seen the show, we’re talking eight seasons (and a TV movie) of one of the biggest pop culture phenomenons to come along in years. You can always head down to your local entertainment store to get your Jack Bauer fix, but I recommend buying 24: The Complete Series from Amazon. That’s because Amazon’s low prices simply cannot be beat, and they’ve even shown the ability to outdo Wal-Mart on the price of books, movies, and music. The cost for this item will no doubt fluctuate over time, but you can count on saving at least $100 by ordering 24: The Complete Series from Amazon. That’s a total of 57 discs in a nifty-looking black box featuring the gun-toting Jack Bauer on the front. This is the first time that the entire hit series has been included in one collection, and it’s likely to be the last. The show debuted in November of 2001. The series finale was shown on May 24th of 2010, for a total of 192 episodes over eight seasons. 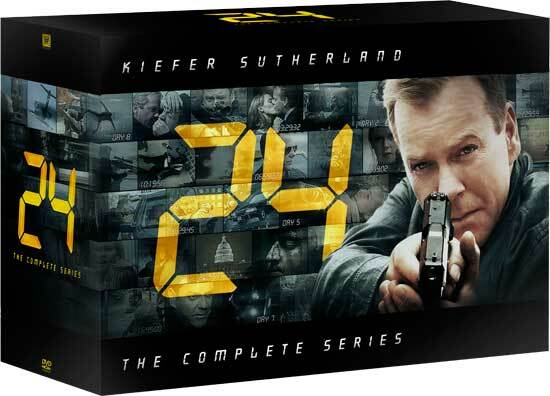 Each 24-episode season covers 24 hours in the life of Jack Bauer (Kiefer Sutherland), a no-nonsense government agent who races to stop terrorist plots, defuse bombs, and gun down plenty of bad guys along the way. Each episode in a season is devoted to one hour of Jack’s life, and events occur in real time. A huge hit with the public, 24 has also managed to capture the attention of critics. The show has received many awards, including Outstanding Drama Series at the 2006 Emmy Awards and Best Drama Series at the 2003 Golden Globes. Kiefer Sutherland has also been awarded for his acting on the series at the Golden Globes and Emmys. 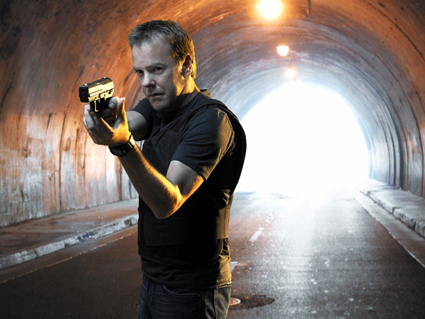 When it comes to shows focusing on espionage and intrigue, 24 is the longest-running example. Even legendary series such as The Avengers and Mission: Impossible couldn’t match 24’s impressive eight-season run. Nobody is safe on the series, and recurring characters tend to drop like flies. In fact, many shows have since adopted this model to keep viewers guessing and create a sense that anything can happen. On 24, the death of an important character is memorialized with a silent clock going into the commercial break (the clock normally counts down loudly before commercials). Now it’s time for a brief summary of each and every season of 24. I’ve kept things pretty simple, but you should still be able to get an idea of the type of problems Jack will face. 24 was also known for including a number of recognizable television and film actors in various roles. I’ve listed a number of them, as well. The series begins with Jack Bauer as the head of the fictional CTU (Counter Terrorist Unit) based in Los Angeles. On the day of the presidential primary, Jack and his team must prevent assassins from killing presidential candidate Senator David Palmer, as well as discover who’s behind the events. When Bauer’s wife and daughter are kidnapped, he must choose between giving in to the demands of those responsible or finding an alternate way to save them. Meanwhile, a mole in CTU is hampering their ability to stay one step ahead of the bad guys. Season Two takes place 18 months after the conclusion of the previous season. Jack Bauer and President David Palmer must work together to stop terrorists from detonating a nuclear bomb in the city of Los Angeles. Meanwhile, a woman gets caught in the middle of events when she begins to suspect her sister’s fiancée of being a terrorist. Jack’s daughter rescues an abused girl and is pursued by the abusive father. Jack gets tortured, CTU falls under attack, an authority figure is exposed to lethal doses of radiation, and President Palmer must beware of enemies within his own cabinet. There’s even a little time for flirting and romance, as Jack is drawn to Kate Warner, and the popular romance between Michelle Dessler and Tony Almeida begins to bloom. Season Three takes place three years later, and it finds Jack battling to recover from a heroin addiction he picked up while undercover. Terrorists threaten to unleash a killer virus in Los Angeles, and Jack and his new partner (who’s also dating Jack’s daughter) must risk life and limb to stop them. President Palmer deals with scandal while running for re-election, and Jack gets a chance for revenge against a traitor who murdered someone close to him. Meanwhile, CTU computer whiz Chloe O’Brien drives everyone nuts with her poor people skills. Picking up 18 months after the previous season, Jack Bauer is now working for the Secretary of Defense. But he soon finds himself called back into action with CTU when a terrorist leader launches a variety of attacks on U.S. soil. Air Force One is shot down, nuclear power plants undergo meltdowns, and a nuclear missile is launched. To further complicate matters, there’s another mole working at CTU, Jack finds that his own government is trying to have him killed, and the Chinese believe our hero had something to do with a shootout and murder at their embassy in Los Angeles. Set 18 months after the events in Season Four, we find Jack Bauer hiding out under an alias and working as a day laborer at an oil refinery. But there’s no rest for our weary hero, as he’s soon involved in an attack by Russian terrorists who oppose the upcoming anti-terrorism alliance between the leader of Russia and U.S. President Charles Logan. When a close friend is killed and Jack is framed for the murder, he vows to get revenge at any price. Meanwhile, a massive government conspiracy is uncovered, and a multi-season villain raises his head. Picking up 20 months later, Season Six finds the U.S. in a state of panic after a series of suicide bombings. When a man offers to give up the identity of the terrorist responsible for these attacks, he asks for Jack Bauer to be delivered in return. So negotiations take place to get Jack released from a Chinese prison camp (where he begins the season), and he agrees to sacrifice his life to help save the country he holds so dear. But there are plenty of twists to come, as the real menace involves a plot to detonate a series of suitcase nukes on American soil. Jack must also face the horrifying fact that members of his own family may be involved in the day’s events. Set between Season Six and Season Seven, 24: Redemption finds Jack Bauer taking part in missionary work in an impoverished African nation. As rebels lead an overthrow of the government, Jack and an old pal must save a group of children. Meanwhile, Jack is ordered to return to America and appear before the Senate to answer charges regarding torture, and the nation prepares to see its first female president sworn in. The events of this TV movie directly flow into Season Seven. Set 65 days after the events in 24: Redemption, this season finds CTU disbanded by the government and Jack under questioning by the Senate. When evidence turns up that one of Jack’s oldest friends has went rogue, the ever-dutiful Bauer is once again recruited to save the day. Teaming up with tough FBI agent Renee Walker, Jack deals with dangers ranging from an attack on the country’s computer infrastructure to an all-out assault on the White House. This season takes place 18 months later, with Jack Bauer trying to stop assassins from disrupting a peace summit between the U.S. and the fictional Islamic Republic of Kamistan. As the season begins, he’s just a private citizen looking forward to spending time with his granddaughter. But that doesn’t last long, as he’s soon carrying a satchel filled with weapons, executing moles within CTU, and threatening to kill a former president. With World War III looming, can Jack save the day one last time? As you can see, 24: The Complete Series is loaded down with double-crosses, death, and even the occasional doomed romance. The villains are memorable, the tension fierce, and you’ll never find a show so skilled at the art of the cliffhanger. Order 24: The Complete Series from Amazon and see what all the fuss is about. We do get a small commission when you make a purchase, but it has no bearing on your price tag. This entry was posted on Wednesday, November 10th, 2010 at 7:02 pm and is filed under Good Movies, New DVD Releases. You can follow any responses to this entry through the RSS 2.0 feed. You can leave a response, or trackback from your own site.